Abstract. The overdevelopment of cities since the industrial revolution has shown the need to incorporate a sound geological knowledge in the management of required subsurface infrastructures and in the assessment of increasingly needed groundwater resources. Additionally, the scarcity of outcrops and the technical difficulty to conduct underground exploration in urban areas highlights the importance of implementing efficient management plans that deal with the legacy of heterogeneous subsurface information. To deal with these difficulties, a methodology has been proposed to integrate all the available spatio-temporal data into a comprehensive spatial database and a set of tools that facilitates the analysis and processing of the existing and newly added data for the city of Barcelona (NE Spain). Here we present the resulting actual subsurface 3-D geological model that incorporates and articulates all the information stored in the database. The methodology applied to Barcelona benefited from a good collaboration between administrative bodies and researchers that enabled the realization of a comprehensive geological database despite logistic difficulties. 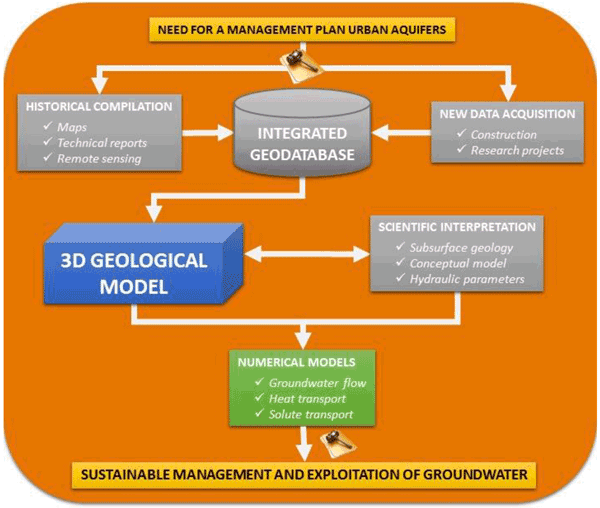 Currently, the public administration and also private sectors both benefit from the geological understanding acquired in the city of Barcelona, for example, when preparing the hydrogeological models used in groundwater assessment plans. 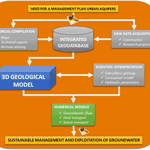 The methodology further facilitates the continuous incorporation of new data in the implementation and sustainable management of urban groundwater, and also contributes to significantly reducing the costs of new infrastructures. How to cite: Vázquez-Suñé, E., Ángel Marazuela, M., Velasco, V., Diviu, M., Pérez-Estaún, A., and Álvarez-Marrón, J.: A geological model for the management of subsurface data in the urban environment of Barcelona and surrounding area, Solid Earth, 7, 1317-1329, https://doi.org/10.5194/se-7-1317-2016, 2016.